I was recently pointed to a conversation taking place in the Northern Iowan – a student newspaper of the University of Northern Iowa. The debate is about whether ghost-hunting is science or pseudoscience. The first salvo was apparently fired by Michael Dippold, who took the skeptical position. There is also a response by Peter Allen, defending the science of paranormal investigation. I hope these two students won't mind me jumping in and taking them to school a bit. Here is the problem with what they are doing: it's not science. There's not a single shred of evidence to suggest that ghosts exist, or that they can be identified by cold spots. Why are ghosts cold? Why do they never seem to show up in visible light, but infrared cameras always find them? Why can you never hear them speaking, but finding them in garbled audio (what they call electronic voice phenomenon or EVP) is absurdly common? The answer is that it's easier to find whatever you're looking for in distorted or unclear video and sound. This is a profession that thrives on false positives. I’ve been corresponding with a gentleman, Kevin, who visits allegedly haunted sites in southern California. 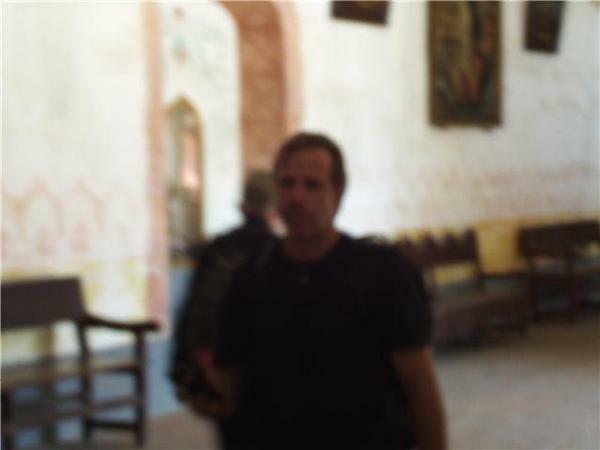 As evidence of his paranormal experiences, he sent me this photograph, taken inside the La Purisima mission in Lompoc, CA. Mision La Purisima Concepcion de Maria Santisima is one of the famous network of Spanish Franciscan missions stretching the length of California, established in the 18th century. Today it’s something of a living history museum. Unlike many of the California missions, La Purisima is no longer used for actual regular worship services. So to start off this week, I’d like to address a few questions received from our readers before I jump into the continuation of our story. Many have asked where can I see this show? Well, at the moment, we don’t have the show in active production. We have finished a pilot episode and demo, and that is being used right now to pitch to agents and TV networks. We are working with some very esteemed individuals and companies that are representing the show for us. We are all making great progress. As we begin to get solid deals put together, we’ll be sure to let you all know. Don’t worry, when the show is picked up, the entire Skeptical Community and hopefully many other people will know that it’s coming! For our international viewers, we’re not certain who will carry it, but rest assured, we’re working hard to give the show the largest audience possible. If we don’t air it outside of US, you can bet we’ll be working on online and home video options as well. In the meantime, I’ll continue to share our exploits into producing the pilot with the Dream Team of skeptics: The Skeptologists! Ah, Pre-Production. Think of it as cramming for the big test, or making weight for the fight, or preparing for cadacism.. Oh wait, strike last last bit. Pre-Production is where all the wheels are set in motion for a production project. By the name of it, I’m guessing you figured out that much, so far on your own. The team and I had been discussing the finer points of the show, and finding our talent and coming up with great ideas. It was time to set a date, and like a wedding, once you set that date, it’s kinda like chasing a burning fuse. Things start to move very quickly. We chose to shoot the first week of April, and true to skeptic form, we decided to have everyone assemble in L.A. for the first time on April first. Boy, I could have played a really rotten April Fool’s joke that night, But I thought better of it. We had Skeptologists arriving from all over in a symphony of plane and car schedules. But before all of that could happen, a lot of work by a lot of fine folks had to take place. We had to figure out just what we were going to shoot, where it would happen and how to get it all done in the precious four days that we had with the cast. Four days.